She departed San Diego on the 30 January 1944, accompanied by USS TRIPOLI CVE 64, USS FITCH DD 462 and USS DECATUR DD 341 bound for Norfolk, Va. During her approach to the Panama Canal, USS SOLOMONS CVE 67 planes participated in a simulated aerial attack on the canal. The carrier arrived at Balboa on 9 February 1944 embarked passengers, and departed for Norfolk two days later. On 12 February 1944 a radar contact was made and torpedo defense was sounded. The USS FITCH DD 462 left the formation to investigate but there was no further radar contacts. 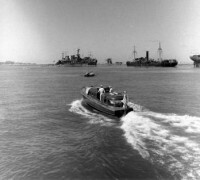 The ship arrived in Norfolk two days later on 16 February 1944. Upon arrival the ship was put into dry-dock until the 19 March 1944. 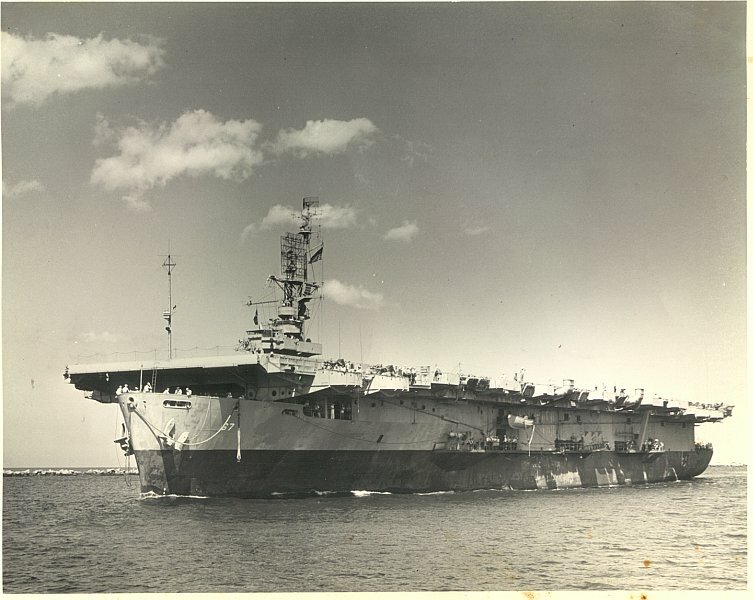 After repairs were finished the loading of planes, supplies, and aviation stores commenced and the USS SOLOMONS CVE 67 got underway on 21 March 1944 bound for Recife, Pernambuco Brazil where she was to report for duty to the Commander, FOURTH Fleet. The USS EISNER DE 192 and USS WILLIAM G. THOMAS DE 193 joined the USS SOLOMONS CVE 67 before they departed Norfolk. While enroute to Brazil air operations were conducted. On 25 March 1944 a torpedo bomber crashed into the after part of the SOLOMONS flight deck. The USS EISNER DE 192 quickly picked up the pilot and crew. On 30 March 1944 the USS SOLOMONS CVE 67 crossed the Equator. On 31 March 1944 the USS TRUMPTER DE 180, USS STRAUB DE 181, and USS GUSTAFSON DE 182 joined the USS SOLOMONS CVE 67. On 6 April 1944 a sound contact was reported but further investigation proved negative. They arrived in Recife, Brazil on 13 April 1944 and reported for duty with the 4th Fleet. The Composite Squadron NINE was disembarked to the Ibura Airfield, Recife, Pernambuco, Brazil. (1.) On the next day, she got underway for her first antisubmarine patrol. This cruise, which lasted until the 30 April 1944, Her next antisubmarine patrol, 4 - 20 May 1944, also proved uneventful. 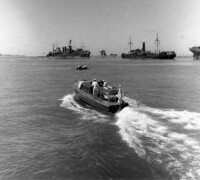 Her third patrol, however, was to be more successful. Departing Recife in 1 June 1944, USS SOLOMONS CVE 67 was soon involved in her sole U-boat engagement of the war. (4.) On 15 June, while conducting air operations a sound contact was received. Ensign Edwards, a pilot from the USS SOLOMONS CVE 67 reported contact with an enemy submarine some 50 miles from the carrier. No further communication was ever received from Ensign Edwards. (1.) The escorts, USS STRAUB DE-181 and HERZOG DE-178 were immediately directed to the position of the contact (4.) and ordered to conduct, a square search. The pilot, who had made the initial contact on the submarine, was shot down by enemy antiaircraft fire. Lieutenant Commander Avery, another pilot from the USS SOLOMONS CVE 67 sighted the wake at 1654 of a fully surfaced submarine. When he was 8 miles from the submarine it altered course and as the plane closed the distance the sub began to run in circles of about 1,000 feet in diameter, successfully keeping the aircraft on its stern. During maneuvers intense anti-aircraft fire was directed at the plane as he circled the submarine at a range of 4,000 yards awaiting assistance. Ensign Wadsworth in Fighting Squadron-17, Ensign McMahon in Fighting Squadron-23, and Ensign Spear in Attack Bomber- Squadron-ll were about to land aboard the carrier when the contact report was made. They were vectored to the scene of the contact. USS STRAUB DE-181 and HERZOG DE-178 were ordered to proceed to the scene of the contact immediately. McMahon and Wadsworth commenced strafing runs on the port and starboard quarters respectively, while Spear and Avery made rocket attacks on the submarine. The fighters effectively strafed the sub while Spear and Avery fired 14 rockets in pairs, 12 of which hit the submarine about the conning tower and forward of the conning tower. After this attack, in which four planes passed over the sub in a period of 10 seconds, the submarine straightened out, trailing oil, at a slow speed, and still directing anti-aircraft fire at the planes. Lieutenant (j.g.) Chamberlain and Lieutenant (j.g.) Weigle then took off to proceed to the scene of the attack. Weigle was directed to make a rocket attack, preceded by McMahon, who made another strafing run on the submarine.Of eight rockets fired by Weigle, six of then hit in the lethal area directly in front of the conning tower. The fighters were out of ammunition and were ordered back to the carrier. The submarine's speed had been reduced to 3 knots and it was trailing large quantities of greenish-yellow oil. Chamberlain was directed to begin a depth charge run on the submarine and, in the face of anti-aircraft fire, went in at an altitude of less than 50 feet above the conning tower before he released two depth charges. The depth charges caused a violent explosion which engulfed his plane and started a fire in the, bomb bay and center cockpit. He was able to make a water landing about 500 yards ahead of the submarine. Immediately after his attack the submarine began to sink bow first. Thirty to forty survivors were observed in the water. USS STRAUB DE 181 reported that 21 survivors, including the commanding officer were rescued. It was learned from the rescued prisoners that Ensign Edwards who had made the original contact was shot down. On 18 June 1944 a Memorial Service is held on the USS Solomons, for the American Airmen and German Seamen that were Lost during the sinking of U860. The ships then steamed on, conducting her air operations. On 23 June 1944, USS SOLOMONS CVE 67 arrived in Recife and commenced refueling from the dock. The prisoners were transferred to Commander Fourth Fleet authorities. On 1 July 1944, the pilots that took part in the sinking of the submarine were decorated onboard the USS SOLOMONS CVE 67. The remainder of July was occupied by intense air operations off the coast of Brazil. On 1 August 1944 found the USS SOLOMONS CVE 67 in company with the USS ALGER DE 101, USS TRUMPETER DE 180, and the USS STRAUB DE 181, conducting barrier operations against enemy submarines. However no contacts were made and on 8 August 1944 she entered the harbor of Rio de Janeiro. Accompanied by USS ALGER DE 101, USS TRUMPETER DE 180, and the USS STRAUB DE 181, she departed the following day for Recife. She arrived 12 August 1944 and commenced, loading stores and fresh provisions aboard. On 15 August 1944 the USS SOLOMONS CVE 67 departed Recife enroute to Norfolk Virginia, arriving on 25 August 1944. Until 22 September 1944 she held gunnery exercises and various tests off the coast of Norfolk. She left on 23 September 1944 for Staten Island, N.Y with USS GENTRY DE 349 and USS TRAW DE 350. She arrived on 25 September 1944 and moored to pier #14. (1.) She embarked 150 Army Airmen together with their P-47 aircraft. (4.) Preparations were completed for a long voyage. She departed on 6 October 1944, she steamed to rendezvous with convoy UFG-15B enroute to Casablanca, French Morocco. The convoy was transporting the 100th and 103rd Infantry Divisions.